Fans of sand flocked to Port Aransas for another successful SandFest. If you missed the festivities, here’s a recap followed by some tips for how to get the most out of next year’s event. 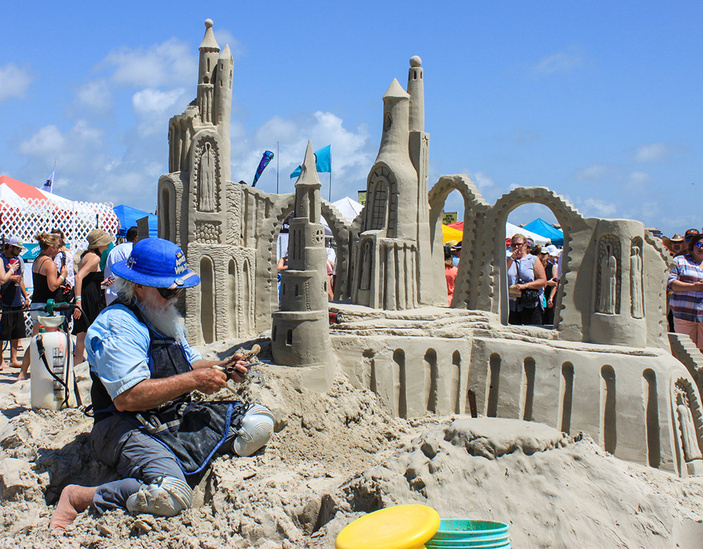 The annual sandcastle sculpting event in Port Aransas attracts over 100,000 people each year. That’s a lot of people for a mile-long stretch of beach! Be sure to have cash on you — at least $20 per person. The entire event is cash-only, from tickets to refreshments and everything in between. There are ATMs on site, but with high withdrawal fees. Buy a beach parking permit in advance to avoid a wait. Beach parking permits are cheap and can be purchased at local stores (learn where here). They are also good until the end of the year. Show up early. The longer you wait to go, the farther you will have to park from the event. Wear a whole lot of sunscreen and comfortable, breathable clothing. It’s hot, and shade is minimal. Bring extra water and stay hydrated. Take breaks. There aren’t many places to sit, so exit the event perimeter every once in a while to rest on the beach or jump in the ocean. The most important tip doesn’t belong on the bulleted list: on Sunday, the last day of the competition, show up an hour before it closes. Not only will the crowd have dissipated, but the sand sculptures will be complete. The 2017 winners are announced on the last day of SandFest. Congratulations to the 2017 winners and see you next year! For more information on Texas SandFest, visit our comprehensive guide here.